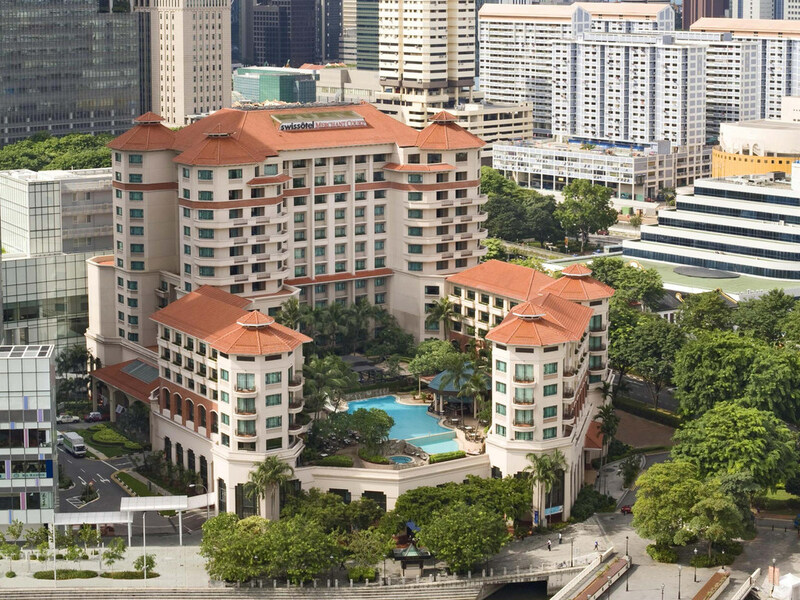 Swissôtel Merchant Court, Singapore is a luxury hotel ideally located by Clarke Quay, within walking distance to the financial hub of Raffles Place, and close to major places of interest including Orchard Road, Chinatown and the numerous bars and restaurants on the famous Clarke Quay and Boat Quay. The 476 beautifully appointed guest rooms and suites offer free WiFi and cater to the needs of discerning travellers, featuring state-of-the-art technology and exclusive amenities. The hotels 476 contemporary non-smoking guest rooms and suites offer free Wi-Fi and luxury accommodation to both leisure and business travelers. The Blue Potato restaurant has a Western a la Carte menu with a selection of fine wines and beverages. It features an open grill kitchen by the pool deck providing an outdoor setting with a picturesque view of Clarke Quay and the Singapore River. Delight in Peranakan favourites, local delights and international cuisine at Ellenborough Market Café in the restaurant or outdoors along the banks of the historic Singapore River. Crossroads Bar at the lobby is ideal for a relaxing drink or a less formal get-together. Relax and unwind with a selection of Asian-inspired cocktails, wines, beers and juices. Dear Ms. S., Thank you very much for taking the time to participate in our online guest satisfaction survey. It is only with the assistance of our guests that we are able to maintain or even improve our high standards of service. At Swissôtel Merchant Court Singapore, we aim to bring quality to our guests’ lives. I take your positive remarks as a reward for our efforts, but also as a challenge, to keep striving for excellence. I am delighted to learn that you had a pleasant stay with us and that the facilities and service rendered by our team have met your expectations. My team and I are looking forward, dear Ms. S. to welcoming you again at Swissôtel Merchant Court, Singapore. Best regards, Rainer Tenius General Manager Swissôtel Merchant Court, Singapore 20 Merchant Road | Singapore 058281 Tel: +6… | Fax: +6… ra… | www.swissotel.com/singapore-merchantcourt Be a member, live it well. Enroll to Swissotel Circle! Dear Ms. c., Thank you very much for taking the time to participate in our online guest satisfaction survey. It is only with the assistance of our guests that we are able to maintain or even improve our high standards of service. At Swissôtel Merchant Court Singapore, we aim to bring quality to our guests’ lives. I take your positive remarks as a reward for our efforts, but also as a challenge, to keep striving for excellence. I am delighted to learn that you had a pleasant stay with us and that the facilities and service rendered by our team have met your expectations. My team and I are looking forward, dear Ms. c. to welcoming you again at Swissôtel Merchant Court, Singapore. Best regards, Rainer Tenius General Manager Swissôtel Merchant Court, Singapore 20 Merchant Road | Singapore 058281 Tel: +6… | Fax: +6… ra… | www.swissotel.com/singapore-merchantcourt Be a member, live it well. Enroll to Swissotel Circle! Dear Ms. P., Thank you very much for taking the time to participate in our online guest satisfaction survey. It is only with the assistance of our guests that we are able to maintain or even improve our high standards of service. At Swissôtel Merchant Court Singapore, we aim to bring quality to our guests’ lives. I take your positive remarks as a reward for our efforts, but also as a challenge, to keep striving for excellence. I am delighted to learn that you had a pleasant stay with us and that the facilities and service rendered by our team have met your expectations. My team and I are looking forward, dear Ms. P. to welcoming you again at Swissôtel Merchant Court, Singapore. Best regards, Rainer Tenius General Manager Swissôtel Merchant Court, Singapore 20 Merchant Road | Singapore 058281 Tel: +6… | Fax: +6… ra… | www.swissotel.com/singapore-merchantcourt Be a member, live it well. Enroll to Swissotel Circle!